The Florida Gators became relevant again in 2012 with an 11-2 record, but the team took on a few losses as key juniors declared early for the NFL Draft. Along with the seniors who graduated, the number of player departures will change the make-up of the 2013 squad. 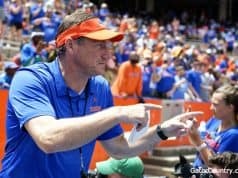 GatorCountry.com takes a look at each position heading into spring football and breakdowns the strength and weaknesses at each spot. Analysis: Obviously, the immediate goal of the tight end position heading into the spring practices is to find a suitable replacement for Jordan Reed, who declared for the NFL Draft. 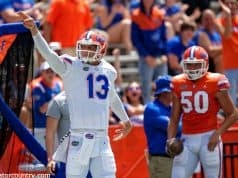 Reed’s biggest contributions to the offense were found in the passing game as he and quarterback Jeff Driskel developed a connection throughout the 2012 season. Reed finished with 45 receptions for 559 yards and three touchdowns and was considered the team’s top pass catcher. If anyone can duplicate Reed’s success in the passing game, it will be Kent Taylor. Coming out of high school, he was regarded as more of a receiving tight end and he showed flashes of his catching ability later in the season with a touchdown reception in the Sugar Bowl. At 6-foot-5, 223-pounds, Taylor is considered the biggest receiving threat out of any of the remaining tight ends, which will always find him a place on the field. Clay Burton and Tevin Westbrook were only used on blocking plays, so the prospects of them getting a lot of receiving targets seems unlikely. However, both Burton and Westbrook have the offseason to improve their catching ability, which would make them more realistic options at tight end. But until they can prove they can consistently haul in passes, it seems like they’ll be utilized more in blocking plays next season. Freshman Colin Thompson sat out 2012 with a foot injury, but the 6-foot-5, 255-pounder expects to make an immediate impact in the blocking game. His size makes him an effective blocker and one the Gators should utilize in 2013. If he’s able to prove himself in the passing game as well, Thompson could make a strong push for significant playing time, but for now, expect him to be used as a blocker rather than a receiver.